All eyes were on a group of Ottawa doctors who performed under extremely stressful conditions, surrounded by bright lights and loud noises, and subject to constant scrutiny. 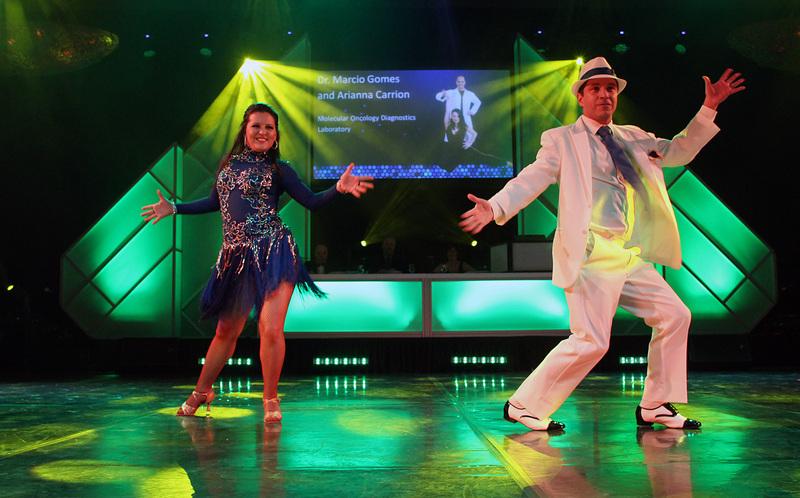 They were hard at work -- not in the operating room but in the ballroom of the Hilton Lac-Leamy, participating in the third annual Dancing with the Docs competition in support of The Ottawa Hospital Foundation. Drs. Amanda Roberts (breast surgeon), Lothar Huebsch (hematologist), Bonnie Weston (ophthalmologist), Philippe Phan (spine surgeon), Mark Clemons (medical oncologist), Andrea Kew (hematologist), Marcio Gomes (pathologist) and Roanne Segal (medical oncologist) have been spending their free time over the last few months learning to ballroom dance. The physicians were partnered with Arthur Murray Dance Studio instructors, who taught them how to spin, flip and perfect their fancy footwork. On Saturday, the dance competition delighted, entertained and inspired a crowd of 730 at the $195-a-ticket gala event. The night raised $160,595 for patient care and research at The Ottawa Hospital, one of Canada’s largest learning and research hospitals. The facility has more than 1,100 beds, about 12,000 staff members and an annual budget of roughly $1.2 billion. Serving as co-hosts were CTV Ottawa News anchors Patricia Boal and Graham Richardson. Hospital vice president Paula Doering was new to the judging panel this year, joining Carlos Lourenco, from the Arthur Murray Dance Studio in Oakville. His Simon Cowell-esque comments were balanced by witty and encouraging words from TSN 1200’s Shawn Simpson. On stage, the docs spoke about the nerve-racking experience, with reactions ranging from terror to relief that it was over to comfort, just knowing an orthopedic surgeon was in the room, should anything have gone wrong. Dr. Segal was the decided winner. The oncologist had raised more than $46,000, but she wasn’t alone; virtually all the participating doctors exceeded their targets by bringing in tens of thousands of dollars for patient care and research for those areas of the hospital that are close to their respective hearts. “I don’t really care about winning,” Segal told OBJ.social as she held onto the giant Medicine Ball trophy (oh, how it twinkled in her arms as she spoke). “I’m really glad that I had the opportunity to do this and to contribute the way I did and to perform the way I did. The gala dinner also included a silent auction and a raffle prize for two Air Canada tickets to any destination across the Atlantic. The tickets were won by Lora Galla, a guest of Ottawa Business Interiors.